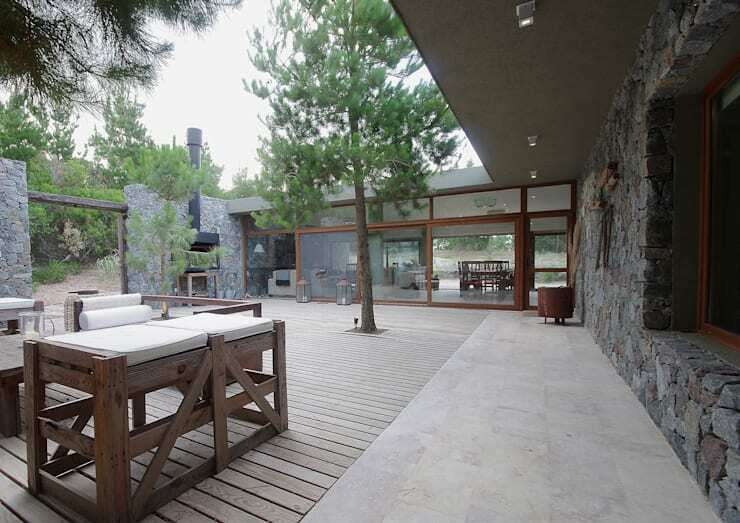 Today we are going to visit Buenos Aires in Argentina, where design professionals Lucas McLean Architects, have imagined, drawn, planned and built the most stylish and contemporary home in the woods. 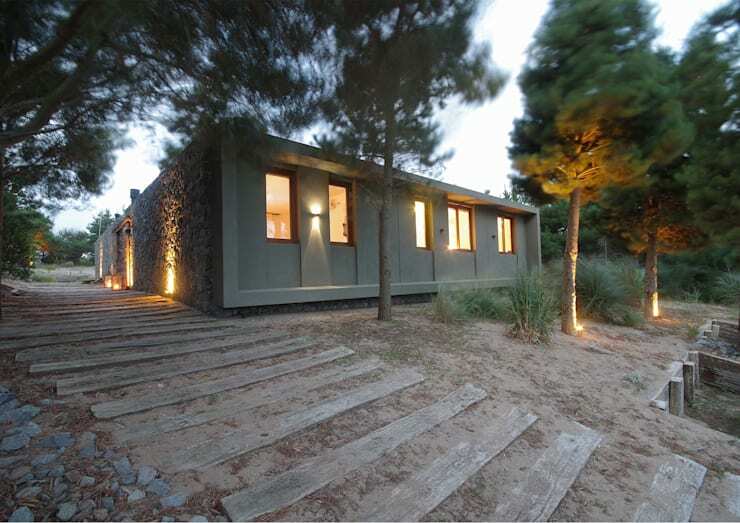 Designed like a cube, this very modern and stylish design contrasts beautifully with the wilderness that surrounds it. As we explore a drawing that the designers came up with as well as an architectural plan that outlines the design more carefully, we will see how the conception directly translates into the fabulous home that we see in the final result. In this image, we catch a glimpse of the home in the woods. It is shaped like a cube, neatly packaged underneath a flat roof. The facade features different textures and tones with a smooth brown plastered wall on the one side and stone cladding on the other wall. This brings an earthy and unique look and feel to the exterior space. The facade is interspersed with glass windows and doors, allowing the home to transcend directly into the wild nature that surrounds it. You'll also notice that there are soft lights installed throughout the facade, illuminating the different details and designs. This is a great design tip. In this image, we can see how the designers drew a little picture of what they wanted the house to look like. 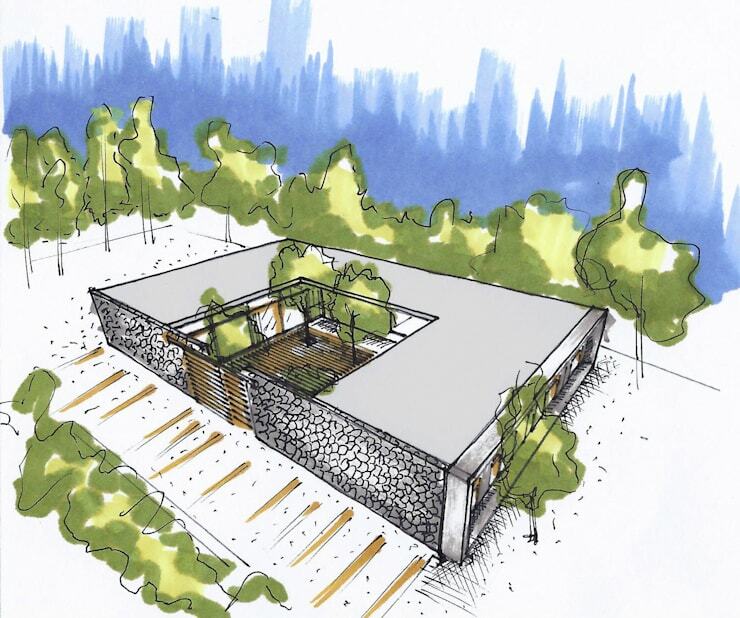 The drawing shows the cube-shaped home neatly positioned within the woods, with its flat roof and textured facade. Right from the get go, they knew what result they wanted to achieve. Having had a glimpse of the final result, we also know that the execution has been flawless. 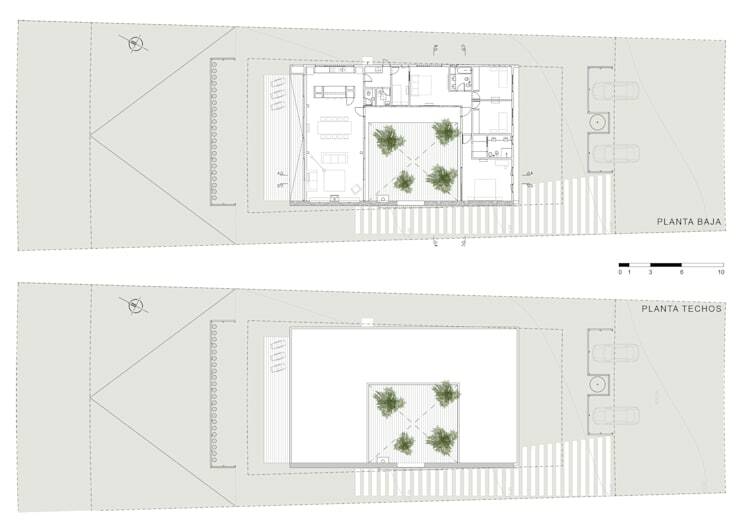 In the drawing, we can see that the designers also wanted to create an open terrace or courtyard in the middle of the home . This open space will breathe new life into the interior design. We can't wait to see what it looks like! Once the architects had an idea of what they wanted in the form of their drawing, they put together an architectural plan. This gives the home owners and designers a clear understanding of what the final project will look like. It also ensures that they are all on the same page. A plan like this also allows for each room in the house and the design itself to be mapped up according to the spatial dimensions. This ensures there are enough square feet to achieve the desired results! Once the home was built, it is absolutely breathtaking. 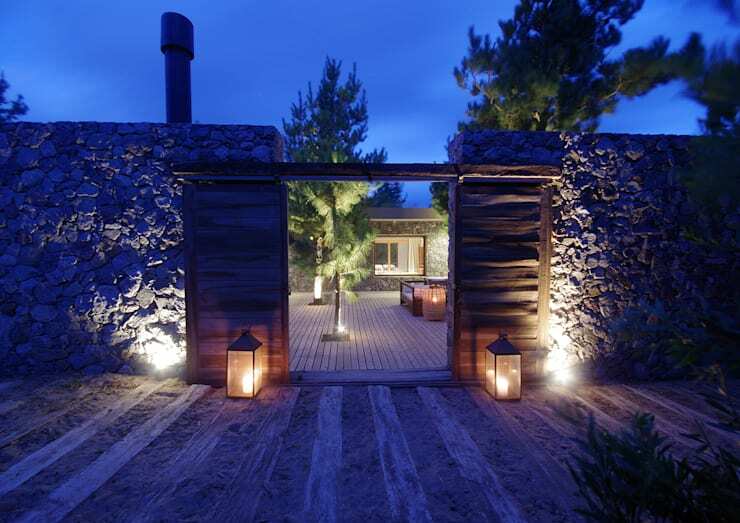 The modern and stylish entrance features a stone pathway that leads up to rustic looking wooden doors. These open up to reveal the open terrace that we saw in the architectural plan. The wooden doors contrast beautifully with the stone walls, creating a very earthy and aesthetically appealing look and feel. Again, we can see how lighting plays a role. The modern and trendy lanterns allow family and guests to see where they are going as they make their way through the entrance, but they also illuminate the gorgeous details. In this image, we come across the division between the interior and exterior spaces and how they flow fluidly between one another. On the right, we have the wooden deck and patio space, while on the left we have the beautiful living space. Throughout both of these areas, the designers use warm and earthy tones and a neutral colour palette. The sliding doors allow the living space to open up onto the terrace if need be, creating a much bigger entertainment space. 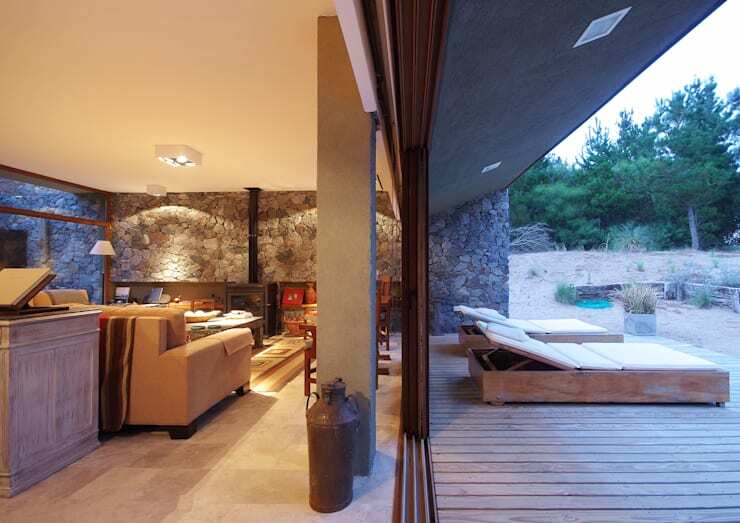 They can also be closed, offering the interior a bit of privacy and warmth. 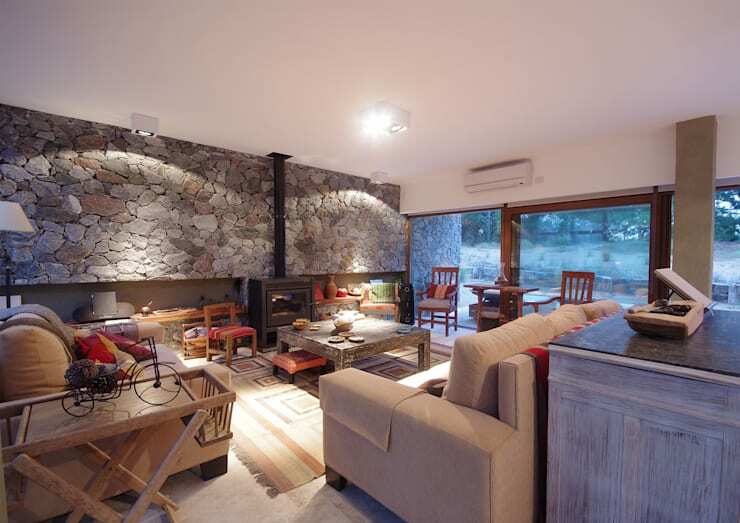 The living room features stone cladding throughout one of the walls, creating a very homely and rustic look and feel. It works in harmony with the screed flooring and the neutral furniture. A splash of red has been added to the design in the form of cushions, decor items and pieces of furniture. At the end of the room, we come across a vintage looking fireplace. This not only provides warmth and coziness to the space, but it looks beautiful too, enhancing the design of this space. 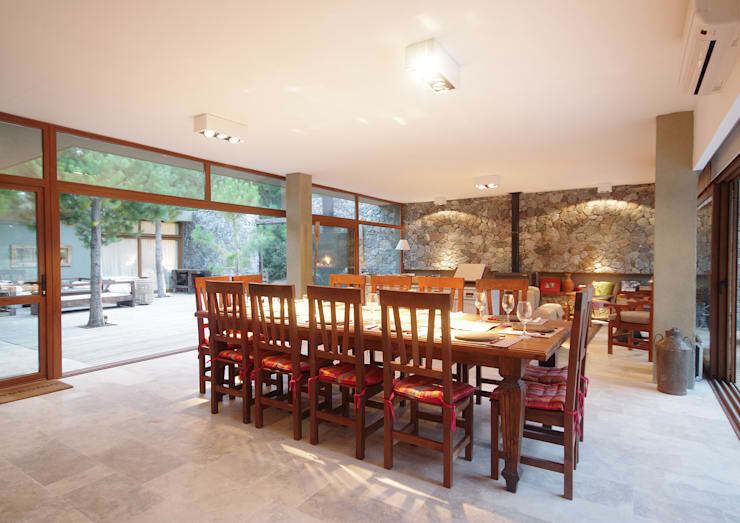 We can also see what a role natural light plays in the home, thanks to the large glass windows and doors. It creates a very bright and light interior, while offering the family views of the woods while they relax in the living room. The open plan living space flows into a luxurious dining room, equipped with a ten-seater dining room table. This allows the family to entertain guests or gather over delicious meals no matter what time of the day. The designers have gone for a traditional wooden dining room table and chairs, which is a great option for a house like this. Wood is a timeless material that looks stylish in all settings. It's also durable and thus a great furniture investment. These wooden chairs have been furnished with red cushions, bringing in that touch of colour and charm that we saw in the living room. We end off our tour on the terrace, which is equipped with beautiful tall trees, flowers and plants. This is truly a little green area packed with fresh air and sunshine. The designers have furnished this space with stylish outdoor chairs, tables and sun loungers. This creates a multi-functional outdoor space that can be used all year round. Can you imagine relaxing here with a cocktail in the evening or hosting a barbeque with the family in the afternoon? What do you think of this impressive design?